Email newsletter system setup for Kill Devil Frozen Custard in Kill Devil Hills, North Carolina. The newsletter allows them to reach out to their summer vacation customers throughout the reach to stay in touch, sell their apparel and announce specials and upcoming events. 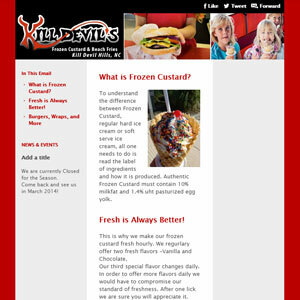 Customers can sign up right on the site to receive the newsletters and it automatically adds them to the list. The list management also automatically updates when someone unsubscribes. With the admin side reports and statistics the business owners can monitor the success of the newsletter campaigns.